Republic Wireless Moto X users are in the process of getting Kit Kat. 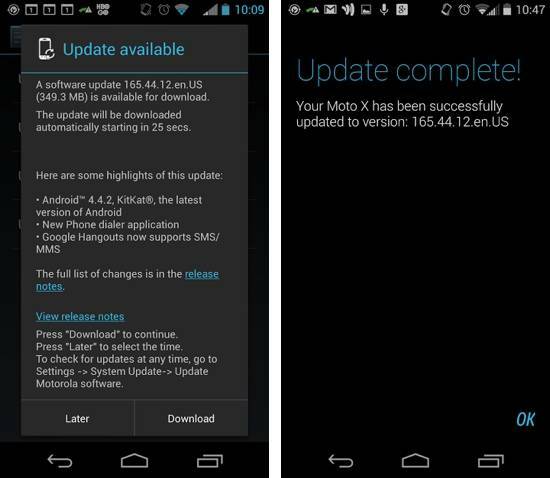 The update is arriving as Android 4.4.2 and leaving the device with software version 165.44.12.en.US. One word of warning though -- as with other Kit Kat updates, it appears this one isn't yet available for all users. Simply put, if you are carrying a Republic Wireless Moto X you will want to be on the lookout for an update notification. Once that notification appears on your device you'll need to follow the prompts. Of course, you can always head in to the settings to try and get the process started a little quicker. Details coming from the Republic Wireless community forums show the update as measuring in at nearly 350MB in size. And once updated, users will see the following; Android 4.4.2 Kit Kat, the new Phone dialer application and an updated version of Google Hangouts with support for SMS and MMS messaging. Needless to say, we saw Google announce the (current) latest Hangouts update yesterday. This means Republic Wireless Moto X users will want to fire up the Play Store and check for app updates after the Kit Kat update has been installed. The update appears to be in the early stages of rolling out, and so far Republic Wireless has yet to offer an official announcement. On the plus side, we aren't seeing any complaints from those who have updated. Though, one tip came in for the Republic app -- make sure you update that after Kit Kat so your calls will properly route over WiFi. Screenshot images courtesy 'stnkyminky' from the Republic Wireless community forums.